Deans in the UO’s schools and colleges are sharing their enthusiasm about the Phil and Penny Knight Campus for Accelerating Scientific Impact. Each of the deans sent messages to their faculty and staff about the announcement of the $500 million Knight gift. Andrew Marcus, the dean of the College of Arts and Sciences, said in his regular dean blog post that translating basic science to serve the public good requires active engagement from every part of the college. Sarah Nutter, the incoming dean of the Lundquist College of Business, and Bruce Blonigen, the college’s interim dean, also shared their excitement about future collaboration in a joint letter to the college. In his message, Scott Pratt, dean of the Graduate School, challenged those working in graduate education to begin looking for collaborations and imagining new opportunities. College of Education Dean Randy Kamphaus expressed deep gratitude for the Knight’s generosity. “In the months ahead I look forward to working with you to ascertain how we will use the momentum created by this gift to do even better work for children, schools, and society,” Kamphaus said. Christoph Lindner, dean of the School of Architecture and Allied Arts, said the Knight Campus will bring significant new creative and intellectual energy to the university that will be felt across the entire campus. “Like A&AA, this initiative places special value on interdisciplinarity and collaboration and for this reason there will be many ways in which A&AA can become involved as the Knight Campus develops. I hope that faculty will embrace the new opportunities that will emerge to collaborate across and beyond disciplinary boundaries,” Linder said. Dean Juan-Carlos Molleda of the School of Journalism and Communication said the gift offers too many positives to begin to even know at this time and said he sees no negatives. Terry Hunt, dean of the Clark Honors College, said a gift of this magnitude will buoy many elements of the university, including its ability to attract and retain the best and brightest students from Oregon and around the country. He sees benefits both for the third of Honors College students who major in the sciences as well all opportunities across the college. “Not only will our students have access to research facilities and resources available through the new campus, but also to the 300 new top-tier scientific researchers that the campus will bring to our community, and who will serve as thesis advisors to honors college students, and teach as Affiliated Faculty in the Clark Honors College,” Hunt said. Law School Dean Michael Moffitt said his colleague and students have the privilege of working and learning every day in a world-class facility made possible by the generosity of Phil and Penny Knight through a transformative gift in the late 1990s. He is excited about how the law school would contribute to work on the Knight Campus. The School of Music and Dance also added its voice to the chorus of celebration. Dean Brad Foley pointed to collaborations between the Department of Dance and human physiology, the music technology program and music perception and cognition research as some of the cutting edge scientific collaborations already going on in the school. He said the school already is a grateful beneficiary of the Knights’ philanthropy through two Knight Professorships. 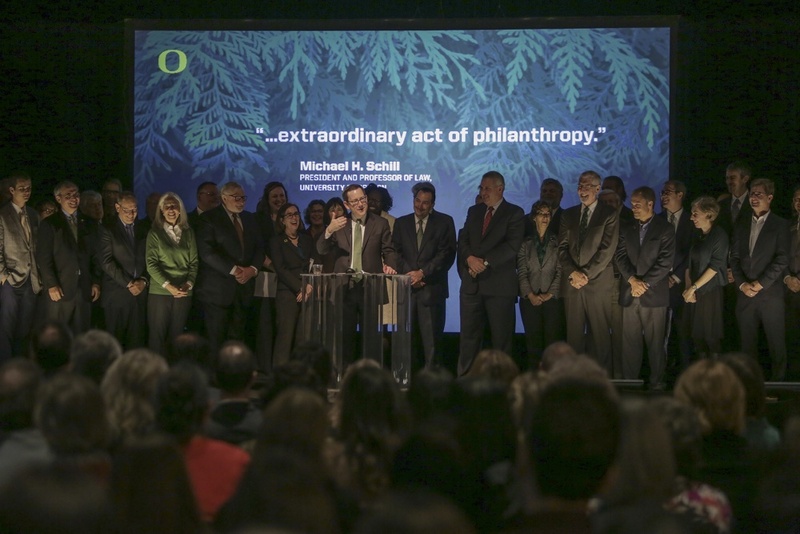 “With their latest gift, the Knight family has once again demonstrated their steadfast support for the University of Oregon, and secured their legacy as unparalleled benefactors of our great state,” Foley said.